Published: June 15, 2018 at 01:29 p.m. 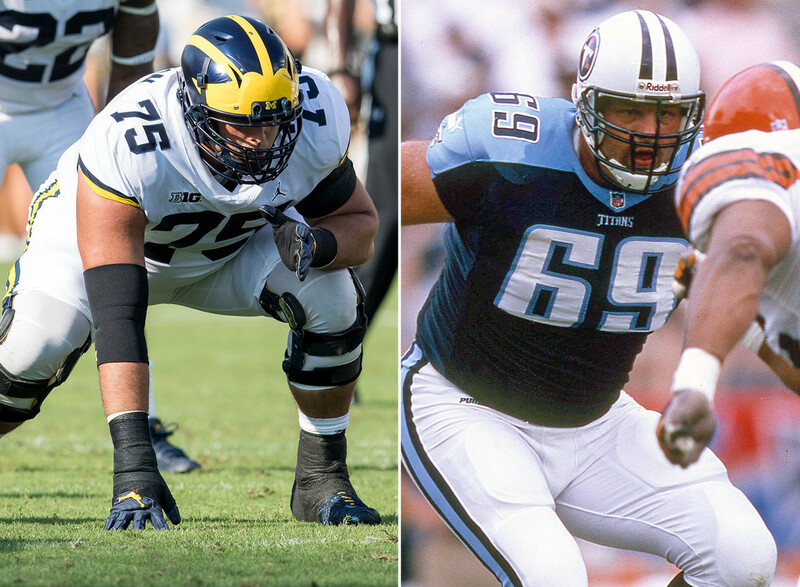 The 18 for '18 series takes a Father's Day theme this week as we look at some of the top players in college football whose fathers played in the NFL. There are other pairings not listed here, some of whom are incoming freshmen from outstanding NFL stock. Alabama's Patrick Surtain, Jr., Florida State's Asante Samuel, Jr., and Ohio State's Taron Vincent (son of NFL executive V.P. of football operations/ former NFL cornerback Troy Vincent) could all make an impact this fall, but each current player listed here has at least seen some college action to date. Notable: Jon Runyan was a first-team All-Big Ten pick at Michigan in 1995 and made 34 career starts for the Wolverines (24 at tackle, 10 at guard). Picked in the fourth round of the 1996 draft by the Houston Oilers, his NFL career was remarkable for his durability -- he didn't miss a regular-season start for 12 consecutive seasons with the Oilers/Titans and Philadelphia Eagles. Runyan Jr. made his first career start in the Outback Bowl against South Carolina on Jan. 1, and is expected to be the Wolverines' starter at right tackle this fall. Notable: Mark Fields was the New Orleans Saints' first-round pick in 1995 as a linebacker from Washington State and the 1994 Pac-10 Defensive Player of the Year. He was selected to two Pro Bowls, one as a Saint and another in his final NFL season with the Carolina Panthers in 2004. Mark Fields II posted the most productive season of his career as a junior last year despite missing much of the season due to injury. In eight games (four starts), he made 20 stops, three for losses, and broke up two passes for the Tigers. Fields will be a strong candidate for a starting role as a senior this fall. Notable: After a stellar career as a wide receiver at Michigan State, the Indianapolis Colts picked Andre Rison in the first round of the 1989 draft. He piled up more than 10,000 career receiving yards, with his best years coming with the Atlanta Falcons in the early 1990s. Hunter Rison originally signed to play at Michigan State as well, but after seeing limited playing time as a freshman in 2017 (19 receptions), he transferred to Kansas State. He'll sit out 2018 at KSU under NCAA transfer rules. Notable: The elder Moss had two brilliant seasons at Marshall, leading the Thundering Herd in its last year at the I-AA level (1996) and its first in I-A (1997). From there, the Minnesota Vikings picked him in the first round in 1998. Moss torched NFL secondaries for 10 1,000-yard seasons, and led the NFL in TD catches five times. He was selected for induction into the Pro Football Hall of Fame as a first-ballot candidate earlier this year. Thaddeus Moss signed with N.C. State in 2016 and saw limited action as a freshman before transferring to LSU. He sat out last season under NCAA transfer rules. He practiced at both tight end and fullback during spring drills and reportedly could see action in an H-back role under new LSU OC Steve Ensminger. Notable: After playing a central role in UM's rise as a national power in the 1980s, Michael Irvin went on to be a first-round draft pick, three-time Super Bowl champion and Hall of Fame wide receiver. He played 12 seasons in the NFL, all with the Cowboys. Michael Irvin II has been a Hurricanes reserve the past two years, but cracked the starting lineup in UM's final three games last year, and worked with the first unit in spring drills. The junior tight end (6-foot-3, 240 pounds) caught three passes in Miami's ACC title-game loss to Clemson. Notable: Lorenzo Neal played at Fresno State and was drafted in the fourth round of the 1993 draft by the New Orleans Saints. A fullback, he played 16 seasons with seven teams and was selected to four Pro Bowls. Lorenzo Neal Jr. (6-3, 315 pounds) was a first-year starter at defensive tackle for Purdue last year and recorded 5.5 tackles for loss. He'll be a junior this fall. Notable: Ray Lewis starred at middle linebacker for the Miami Hurricanes and was a first-round pick of the Baltimore Ravens in 1996. He went on to a Hall of Fame career over 17 seasons with the club, including 13 Pro Bowl nods. Rayshad Lewis, an undersized receiver at 5-10, 165 pounds, caught 40 passes as a true freshman at Utah State in 2016. He then transferred to Maryland and sat out 2017 under NCAA transfer rules. He repped on defense for much of Maryland's spring practice, so a position switch could be coming when his playing career resumes this fall. Notable: The New Orleans Saints drafted Irv Sr. in the first round out of Notre Dame in 1993. He played seven years in the NFL, five with the Saints before finishing his career with the 49ers and Browns. His son is Alabama's most complete tight end and an emerging draft prospect. He's an effective blocker who also led Crimson Tide tight ends in receptions last year with 14.
Notable: A Hall of Famer and Super Bowl champion, the elder Allen played most of his career with the Dallas Cowboys as part of a dominant line that paved the way for RB Emmitt Smith. He was selected to 11 Pro Bowls, 10 as a Cowboy. His son took a season off for undisclosed reasons in 2017, but returns in 2018 as an intriguing draft prospect. A bioengineering major at Harvard, Allen was selected first-team All-Ivy League as a junior in 2016.
Notable: Shawn Jefferson overcame the odds as a ninth-round draft pick, emerging as a 13-year pro at wide receiver with the San Diego Chargers, New England Patriots, Atlanta Falcons and Detroit Lions. He led the NFL in yards per catch in 1998 (22.7). Van Jefferson made 42 catches at Ole Miss last season, but after the Rebels' NCAA sanctions hit, he transferred to Florida, where he'll be immediately eligible as a fourth-year junior this fall. Notable: Carter made nine interceptions in just two seasons at Tennessee (he was a JuCo transfer), and was a first-round pick of the Kansas City Chiefs in 1992. He was the NFL's Defensive Rookie of the Year with seven interceptions in 1992, and was selected to four Pro Bowls in a 12-year NFL career. Warrior, a starting safety, enters his third year at UT. He earned Freshman All-SEC honors in 2016 and last year he led the team in forced fumbles (3) and finished second in tackles (83). Notable: The College Football Hall of Fame welcomed Johnnie Johnson to its ranks in 2007 as a standout defensive back from the University of Texas. The Los Angeles Rams picked him in the first round (1980) and he played 10 NFL seasons. Collin Johnson, an imposing wide receiver at 6-6, 212 pounds, led the Longhorns in receiving last year (765 yards). Johnson played his best game at USC, a double-overtime loss, with seven receptions for 191 yards. He returns as a junior this fall. Notable: Davis, a defensive back at Sam Houston State, was selected to the Southland Conference's All-Decade team of the 2000s. He joined the Dallas Cowboys as an undrafted free agent and played six years with the club, starting a career-high 15 games in 2005. Johnson is a Texas Tech team captain and led the Red Raiders in solo tackles last year with 68. A senior this fall, Johnson has 264 career stops and needs 65 more to crack TT's top 10 for career tackles. Notable: An undrafted free agent from Millersville University, Will Lewis spent two seasons as a return specialist with the Seattle Seahawks and later became a front-office executive with various NFL clubs, most recently serving as the Kansas City Chiefs' director of pro scouting until 2017. Drew Lewis led the Buffaloes with 119 tackles last year in a breakout season as a first-year starter. Notable: As a collegian at Ohio State, Antoine Winfield won the Thorpe Award as the nation's top defensive back. The Buffalo Bills picked him in the first round of the 1999 draft, where he played for five seasons. He was later selected to three Pro Bowls as a Minnesota Viking. Winfield Jr. returns to the Minnesota lineup this fall after a hamstring injury derailed his 2017 season and resulted in a medical redshirt. In just four games last year, he recorded 17 solo tackles, a sack and a blocked field goal. Winfield started as a freshman in 2016.
Notable: The Minnesota Vikings selected Jake Reed out of Grambling State with a third-round pick in 1991. He peaked in the mid-90s with four consecutive 1,000-yard seasons, including a career-high 1,320 in 1996. J.R. Reed is one of the top defensive players for the defending SEC champion Bulldogs. Having transferred from Tulsa, he sat out 2016 and had a breakout season last year -- he was selected as the program's newcomer of the year. He'll be a fourth-year junior this fall. His dad: Marion Barber Jr. Notable: Marion Barber Jr. also attended Minnesota, where he starred as an All-Big Ten running back, and was a second-round pick of the New York Jets in 1981. He played seven NFL seasons as a career reserve. The younger Barber made a huge impact as a first-year starter under first-year coach P.J. Fleck last year, leading Minnesota in tackles with 115 and forced fumbles (3). He'll lead the Golden Gophers' linebacking corps as a junior this fall. Thomas' brother Marion Barber III was a star Minnesota running back from 2001-2004 and went on to play for the Dallas Cowboys and Chicago Bears. Notable: John Bosa, who also played defensive end, played at Boston College and was inducted into the Boston College Varsity Club Hall of Fame in 1996. A first-round pick of the Miami Dolphins, injuries made his NFL career a brief one (three years), but he showed early promise, earning a spot on the 1987 PFWA All-Rookie team. Nick Bosa is among the most feared pass rushers in college football, much like his older brother Joey was before him. Despite splitting playing time last year on a deep and talented Buckeyes defensive line, he was selected as the Big Ten's defensive lineman of the year (8.5 sacks, 16 TFL) and is considered one of the nation's top prospects entering his junior season.